Properties in Norman Rockwell Exhibition average 4.8 out of 5 stars. Mt. Snow Vermont - 'Pike's' Place with Beautiful Mt. Views ! Property 53: Mt. Snow Vermont - 'Pike's' Place with Beautiful Mt. Views ! Property 56: NEW! West Dover Condo w/Deck - 3 Mi to Mount Snow! Property 58: Sunny condo on Vermont golf course! Property 60: Family-friendly condo with shared seasonal pool & hot tub - walk to village! Picturesque apartment on 5 private acres overlooking Bromley Mountain. Property 66: Picturesque apartment on 5 private acres overlooking Bromley Mountain. Property 79: Ski-in/ski-out condo with shared pool, hot tub & sauna - great location! FREE LIFT TICKET FOR WKND RENTAL, LUXE SKI-ON SKI-OFF 2BR @ THE LANDMARK!! 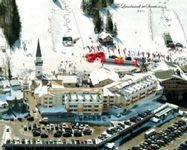 Property 83: FREE LIFT TICKET FOR WKND RENTAL, LUXE SKI-ON SKI-OFF 2BR @ THE LANDMARK!! Property 84: Summer rental at Haystack Golf course. Location and comfort for the perfect get away. Property 89: Location and comfort for the perfect get away. Great condo. Spacious, clean, and comfortable, Everything needed for an enjoyable visit. Great location. Would stay there again. Highly recommended! Thanks Anthony! We enjoyed the spaciousness of this condo. Our young adult son stayed on one side w/bath and we had the master suite on the other side of the condo...We found the condo clean and very comfortable. The view of the mountain and morning sunrise are spectacular. The owner was timely with all the instructions and checked in with us after we arrived too. Would definitely stay here again!